BROOKINGS, SD- An exhibit of Madonnas, created by Edward Hogan, is being featured in the Brookings Arts Council East Gallery during the Festival of Trees Holiday Event. Edward Hogan is a former SDSU Professor who was responsible for creating the state’s only Geography Program. He was named by Governor George Mickelson, the State Geographer of South Dakota, and among his numerous awards and recognitions, he is also Professor Emeritus of Geography, Chief Information Technology Officer Emeritus and Associate Vice President for Academic Affairs Emeritus at South Dakota State University. Among those many prestigious honors, Hogan is also a published author, having co-authored books with his daughter Erin and wife Joan on geography, Norway and Ireland. He has made twenty trips to Ireland over the last twenty-three years. His major research interests are: South Dakota, Ireland, geography, demography, housetypes, genealogy, lighthouses, and spiritual/religious sites. Ed attributes his interest in art developing because of the influences of two talented relatives; a maternal great aunt and a paternal uncle. He has very eclectic tastes and it is reflected in his artwork. He has previously exhibited his artwork at the former Evanhoff Gallery in Brookings and at the Brookings Public Library. 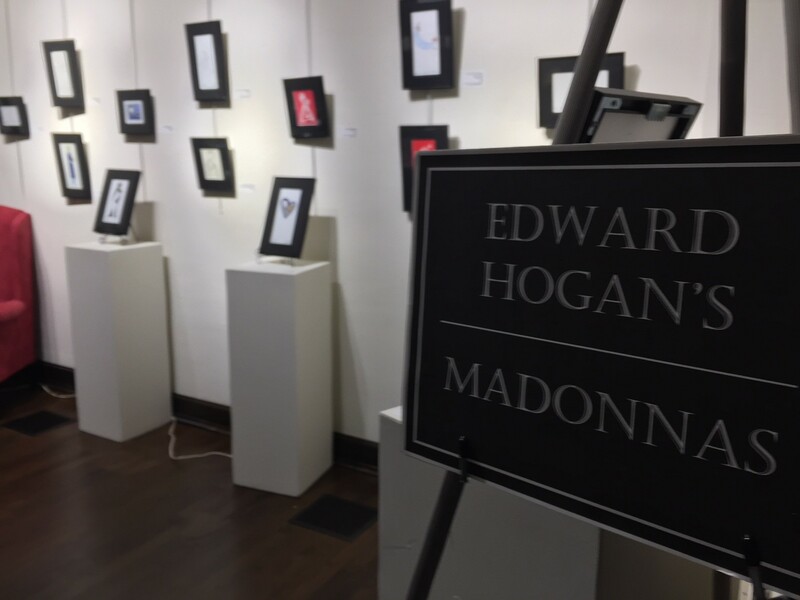 Hogan’s current exhibit features Madonnas, that he has created yearly, often to commemorate a loved friend or relative. The twenty-three framed artworks depict the Madonna in a variety of styles, color and medium. The Brookings Arts Council is honored to host Ed and his artwork during this festive holiday season. The exhibit is open to the public through Saturday, December 23. There is no admission charge. The Brookings Arts Council is open Tuesdays through Saturdays, Noon to 5, with some limited Sundays for the holiday season. For more information, contact 605-692-4177 or email at artscouncil@brookings.net.